This Amazon Studio series marks the third TV adaptation for creator Ben Endlund’s satirical comic book hero. Each iteration of The Tick has brought us something different and unique, reflective of the format that it was placed into. The 1994 animated series brought us a version full of comic book weirdness, but tamed for the child friendly time slot. The 2001 live action version was conscious of it’s budget, so brought us a diner comedy based around the mundane margins of the superheroic. This latest version aims at a more traditional take, but updates it to a modern format, taking account of the rise in long form story telling for TV that has occurred in the 30 years since the character’s initial creation. Arthur Everest (Griffin Newman) is a mild mannered, and nervous accountant in The City. Despite this skittishness, Arthur is carrying out surveillance on the city’s underworld to prove his theory that the long-dead super-villain “The Terror” is still alive and is secretly in charge. What Arthur does find is a mysterious blue hero. Someone that is nigh invulnerable, stronger than a locomotive, and as dumb as a bag of hammers – The Tick (Peter Serafinowicz). Now with the help of a suit of stolen advanced technology (which looks surprisingly like a giant moth), Arthur must decide to accept the call to adventure, and become the sidekick The City needs. The Tick (2017), takes an intelligent tilt at the property. Realising that there is not much they can do to expand the character of The Tick (who works better as an enigma) they’ve instead develop the back story of Arthur, clearing up his motivation and family dynamic. It is a great decision, as it perfectly melds the character’s nervous disposition with, with his seemingly at odds desire to be involved in the world of Superheroes. He’s the everyday person, plagued by his own (often sensible) self doubts. Arthur is more than just the audiences’ point of view character, he’s the aspect of the team that can keep things grounded, the one that is capable of thinking things through, but also one that when he overcomes those fears, is able to achieve great things. Of course, with any version of The Tick, a lot rests on those broad blue shoulders. Serafinowicz, understands the character, approaching it with all the bravado that it requires. His version is similar to Patrick Warburton’s (2001) brash take, with just a hint of sagely Adam West (Batman) thrown in for good measure. He is the titular hero, aware of both his grand undertaking (to fight crime), and his destiny to do so. It’s just that, as always, The Tick is not to aware of almost anything else. Nigh invulnerable, he has the strength to lift a bus, but barely the intelligence to ride on one. 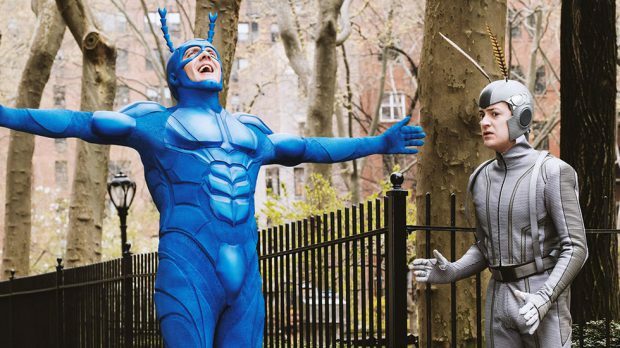 The resulting pairing of The Tick and Arthur, produces a great comedy of opposites, and allows for a satirical exploration into the superhero genre. Here The Tick’s naively earnest brand of upright hero is pitched, not only against the real world, but a comic book world that has gotten steadily grittier since the 80s, with the rise of popular anti-heroes. Add to this that the writers have not only nailed the voice of his corny justice ladled rhetoric, but have added an awareness of the hero’s journey that often breaks the fourth wall, and the show is full of pithy dialogue and clever comedy. The first half of season one is certainly brimming with promise, we will just need to see it the end half sticks the landing. The Tick is currently streaming on Amazon Prime.